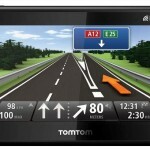 Last week, I received a mouth-watering package from the good folk at TomTom South Africa — an iPhone 4 and a Tom Tom car kit. I had been wanting to test their GPS app out for quite a while, as I had only heard good things about it, and after reviewing other iPhone GPS apps, I wanted to see how TomTom stacked up. The latest update to the TomTom Southern Africa app (iTunes Link US$59.99) delivers a much-anticipated feature called HD Traffic (In-App purchase US$37.99 for 12 months or US$5.99 for 1 month), a service which allows you to see where there is traffic congestion on the map, in real time. For users who travel quite a bit during the day, this is a must have. If you have a route selected, the app will also then re-route you onto the best route available, according to the traffic congestion. So, last week when I received my package, which consisted of a shiny new iPhone 4, and the TomTom car kit, I quickly unpacked it, and rushed off to the car to set it all up. The car kit is really simple to install, and has a great “suction mechanism”, which means that not once did I ever see the cradle bouncing up and down. The really cool thing about the car kit is that is has a built-in Bluetooth hands free, which means no more talking and driving. Again, this was really simple to set up, as the cradle found the phone instantly, and paired the devices. Built into the car kit is a GPS receiver, which extends your GPS signal when using the app. This is great and definitely helps with faster lock on when acquiring GPS signal on the iPhone. The TomTom app itself is also really simple to use, and the functionality is fantastic. The navigational controls are large and easy to use. The TomTom iPhone app also offers street name announcement, which means it tells you what road to turn into when driving to a location. This is an awesome feature, which is usually only found on much higher end models of the physical GPS units. The app also runs in the background when you exit, so you won’t lose your position when taking a call, or have to use another app. There are a couple of other features (which I didn’t manage to use) that really make this app stand out above the rest. IQ Routesis a feature built into the app which takes into account various factors such as rush hour, traffic lights & even shopping crowds when calculating your route. This means you will get to your destination faster, as it selects the best route. Another great feature is called Map-Share which allows you to edit the map if there have been any changes to the road. So if suddenly a road is closed or a boom gate is installed, you can pin point this on your map, which then gets uploaded to a central location, and is then shared with other users of the app. A great, practical application of crowdsourcing! All in all, I was very impressed with the TomTom iPhone app. The app, which costs US$59.99 from the iTunes app store, is well worth the price it comes at. Add in the HD traffic for a year and you are looking at just under US$100 for full-blown GPS app. The maps also get updated fairly regularly, which is a bonus in the chaos of ever-changing street names in South Africa. In South Africa, the car kit, which can be bought at a number of stores, including Makro, Dion Wired & Cape Union Mart, retails for around R1 200. This may sound a bit high, but I can honestly say that, after using it for a week, it is well worth the price. For this you get a fully fledged iPhone cradle for your car with built-in GPS & Bluetooth functionality. I know that I will definitely be getting myself one of these for my car in the near future. Overall, the app & car kit are both great buys, and if you are looking for a quality South African iPhone GPS app, then TomTom is the way to go.